Here I have newly created girl, she has new face mold,with big lips (and I mean it :)) and I just finished making her first wig in bright pink, the second one will probably be black and short. This will be a very special looking girl! 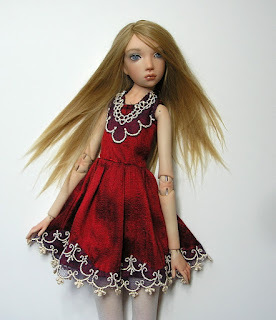 Merry Christmas doll on eBay here! 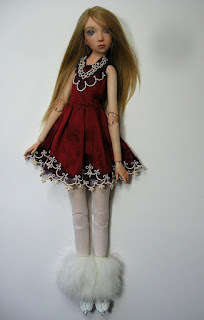 Merry Christmas doll will go on eBay tonight! I am learning to paint small eyelashes and I am satisfied here, I gave her more makeup than usually (it's Xmas :)) so she looks a little older than Lilly, I think you couldn't even tell it is the same face mold, anyway the eBay auction will begin tonight with a starting bid of 1250$, will go for 7 days.